As a kid I loved Scooby Doo, and to be fair I guess I still do now. Scooby and Shaggy are one of the greatest double acts in cartoon history, with their legendary cowardice only being challenged by their enormous appetites. Fred, Velma and Daphne may not have been as much fun, but they got the job done, solving the mysteries were flair (and flares in Fred’s case) and apart from Daphne always being the one who got captured by the ghost, and Fred always making the same mistake of sending Scooby and Shaggy off on their own (or possibly with Velma), I have nothing against any of them. They made a good team, and I still dig the Mystery Machines groovy paint job. See, I’m getting so into it I’m beginning to sound like Shaggy! 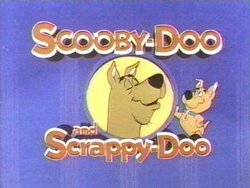 I distinctly remember going into school one day and a friend telling me there was a new series of Scooby Doo on that afternoon, with a new character – Scoob’s nephew Scrappy. I spent the rest of the day looking forward to watching the new series, thinking of the theme tune (Scooby Dooby Doo, where are you, we’ve got some work to do now), the haunted house with all the bats from the title sequence and wondering if, just once, there would be a real ghost rather than the irate uncle who missed out on the inheritance who would have got away with it if it wasn’t for those meddling kids. So, I get home that afternoon, and tune in ready for some more fun. Oh, how my heart was broken that day. Things started promisingly, the gang were all there, the Mystery Machine still looked cool, and Scooby and Shaggy were just as cowardly as ever. Trouble is, all that good work was undone by the mere addition of Scrappy Doo. A ridiculously small puppy with an annoying voice and even more annoying catchphrase (Ta da da da da-da! Puppy Power! – I cringe even now…) had ruined everything. Scrappy was forever trying to box with the ghost, was completely fearless to the point of stupidity, and was generally annoying all round. He even ended up solving too much of the mystery, stealing Fred, Daphne and Velma’s limelight as well. Hanna Barbera have finally seen the error of their ways, and the most recent Scooby Doo cartoons do appear to have dropped Scrappy Doo, but it took long enough. First they dropped Fred, Daphne and Velma from the show, keeping Scrappy Doo for some inexplicable reason. Later, they even gave Scrappy his own cartoon with a bunch of other puppy dog characters. As you can tell, I didn’t really like Scrappy Doo, even as a child, and it would appear that most people do agree with me. How do you feel? Can we find the one person on the planet who liked Scrappy Doo?! This entry is filed under TV - Cartoons	and was posted on September 3rd, 2007. You can follow any responses to this entry through the RSS 2.0 feed. You can leave a response, or trackback from your own site. Ooooh, just found a Scooby Doo movies v1 in HMV: 3 stooges, batman & robin and 2 people I’ve never heard of. Get Laurel & Hardy & the Harlem Globetrotters* out there asap. Godzookie was pretty annoying, but Scrappy was still far more annoying I feel. Oh yeah. The puppy must die. Horribly.